A few months after Thomas* joined a $6B heavy-equipment manufacturing company as CEO, the board suggested executive coaching to help with the transition. Thomas felt obligated to accept the offer, although it was clear from the beginning that he saw little value in it. It was “soft stuff,” and he had important work to do with no time to waste. Thomas’s mission was to turn around a business that had been on a multi-year downward slide. He had lots to contend with. The company had seen three CEOs come and go in the previous five years, and the man he relieved had been well-liked by his 12,500 employees. The fact that Thomas was brought in from the outside frustrated the already demoralized leadership team. On top of all that, Thomas was very young for such a big responsibility. We started our coaching after I interviewed 12 of Thomas’s stakeholders, including most of his leadership team, a few board members, and two of his biggest customers. In these one-on-one conversations, I probed for their experiences with Thomas and got a good picture of not only how he was perceived, but also who he was and what he was trying to do. Everyone agreed that Thomas had many strengths: extremely bright, a quick study, decisive, results-focused, highly experienced in operations, and able to communicate clearly. But, as is typical, Thomas had a tendency to overuse these strengths, especially when stressed. Since the pressure was often intense, he had a lot to work on. His brilliance made it difficult for him to listen patiently to others, alienating them and shutting them down. He often stretched goals, and his drive to achieve them left his team in the dust, not knowing where or how to help. He crafted and delivered high-impact messages, but his communication reflected only one point of view and tended to be one-way. I learned that in his first three months, he had fired or demoted a few well-liked leaders. He had done deep dives into each business unit and function, analyzing the situation and scrutinizing past decisions. And he had made significant changes in processes that were hard for people to learn and adopt. Successful turnaround artists have an extreme sense of urgency, so there’s not a lot of time to get buy-in from their teams. Thomas’s command and control style had been effective while all eyes were on him to see if he could fix this huge problem. But by the time the bleeding had stopped, his authoritarian style had worn people down, and they had begun to disengage. Thomas gave the impression he knew everything, but he didn’t. 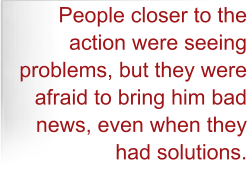 People closer to the action were seeing problems, but they were afraid to bring him bad news, even when they had solutions. Since Thomas was making all the decisions, they simply followed orders, and there was no incentive to work together as a team. The low morale permeated the division, and fear and uncertainty suppressed productivity, leading to expensive mistakes and missed opportunities. After my introductory session with Thomas, we began coaching with a thorough debrief of my 360-degree interviews. Hearing this feedback wasn’t easy for Thomas, but eventually he was able to use what he had learned to set his goals for coaching. Thomas didn’t need help with his strategic or operational skills. He needed to examine his own assumptions and behaviors, and to understand why, when, and how to adapt his leadership style. Specifically, Thomas agreed to work on becoming more accessible and inclusive, developing and empowering his direct reports, and improving collaboration among his leadership team. This is where we started. But Thomas was a tough guy, and the openness and vulnerability that coaching requires were initially a struggle for him. He was so used to being the top dog and above reproach that he relentlessly denied, deflected, minimized, and justified my observations and challenges. I often found myself on the receiving end of his forceful style, and I understood why people responded the way they did. Had I succumbed to Thomas when he pushed back, our sessions would have been a waste of everyone’s time. It definitely would have been lousy coaching. I had to press him quite a bit, until he looked at his behavior and its consequences. Gradually, he began to listen and reflect openly. He started to see the connection between the way he dismissed his team’s value and their poor performance. He saw that he was failing to help his people develop the skills they needed to be effective. And he confessed that the stress and sheer volume of work he was doing was taking a personal toll, both emotional and physical. Thomas accepted that he was going to need guidance in making the changes necessary to sustain growth of the business longer term. He still struggled occasionally with the temptation to argue with my challenges and downplay others’ opinions, but within three months, he had gotten much better at staying quiet enough to hear other perspectives. 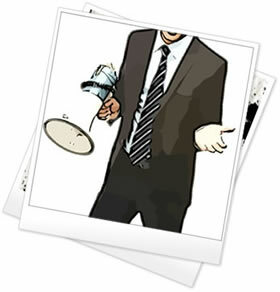 Consequently, he learned some things that were critical to the business. He began to step back a bit to let others make decisions, and he was surprised to see what talent and expertise he had on his team. He even pulled two people he had demoted back into key roles. Six months into our coaching, I encouraged Thomas to get his leadership team together to work on the “soft stuff” like trust and collaboration. I guided them through a very difficult exercise intended to help them understand each other better, and several people really opened up. Thomas did one of the toughest things he had ever done: he told a story about his childhood and the pressure put on him to excel at everything he did. And he blew them away. His direct reports saw a more vulnerable and authentic Thomas. They began to understand more about his motivations and feel empathy for him, softening their fear and sense of alienation. Over the next several months, Thomas’s team began to trust him more, and he worked hard to keep that trust. He learned to loosen up on control and manage his emotions better. He can still slip up, especially when the heat is on. But he’s made it clear to his people that he’s committed to his continued personal development and that he welcomes their feedback about how it’s working. Two and a half years after beginning coaching, Thomas, with the support of his leadership team, had increased revenues by 45% and more than quadrupled profit margins. He is being hounded by search firms desperate for a proven turn-around artist. He considers the options carefully. His journey of personal growth is opening his eyes to all sorts of new possibilities. Right now, his heart is in this company that he developed and grew, and he wants to ensure continued success, not just for the wealth of shareholders, but also for the health and pride of the people who work there. * Thomas is a real person and his story is true; but Thomas is not his real name, and a few other minor facts have been changed to protect his anonymity.